An Algorithm Is A Curator At The Sept. 11 Museum : All Tech Considered Curators at the September 11 Memorial and Museum came up with a novel solution to the problem of interpreting the tragedy. They put a computer algorithm in charge of an exhibit. But is it objective? Timescape_01 from Local Projects on Vimeo. Sept. 11, 2001, means many things — and conflicting things — to each of us. Charged emotions, and debates over a history that's still so recent, made it really hard to design the National September 11 Memorial and Museum in Lower Manhattan. It was so difficult, in fact, that museum curators decided to try something quite new. They decided to hand off major curatorial duties to a computer algorithm. Inside the museum, almost immediately, you see and hear the faces and voices of the dead and those who witnessed the events. Turn a corner and there's a tall steel pillar that spans two floors. It has a big dent — the exact point where the nose of the first plane hit the first tower. Downstairs, Lynn Rigney is showing her daughter a bombed-out firetruck that was pulled from the rubble. Even though she remembers that day vividly, Rigney says, "it just makes it a lot more real." Nearly every inch of the Sept. 11 museum is designed to evoke emotion. With one big exception: The exhibit "Timescape" is designed to create distance. And its curator is an algorithm. "This is a big and messy world," says Jake Barton, founder of Local Projects, the media design firm that programmed it. "And this piece isn't necessarily trying to write a historic narrative. 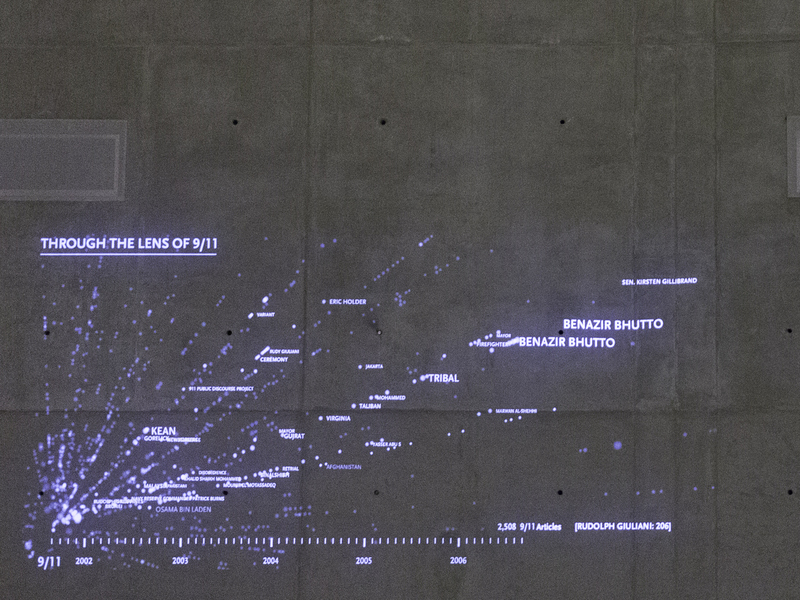 What it's trying to do is chart the impact of 9/11 on our world in a variety of places." The museum gave "Timescape" a wall about 100 feet wide — a big chunk of real estate in the museum. The algorithm combs through over 100 news sources and 2 million articles at lightning speed. It finds key terms related to Sept. 11 and to each other — like "flights," "Boeing" and "Federal Aviation Administration" — and then projects them onto the wall, along with specific headlines. Some of those headlines are surprising, Barton says. "You wouldn't necessarily think, oh, there's an article about Delta Air Lines coming out of bankruptcy and having a banner year. Like what does that have to do with 9/11? Well 9/11 kind of pushed them into bankruptcy." "Timescape" finds words in the news associated with Sept. 11, and weights them according to prominence in a story — not just how often they appear. The algorithm curator does not fact-check — for example, sift out incorrect reports about weapons of mass destruction in Iraq. But the museum's director, Alice Greenwald, says it solves another human problem: our limited perspective. "We're still living in the aftermath of this event. It's not something that happened 50 years ago, or 150 years ago and we know the consequences of that event," she says. "So we weren't, from a curatorial point of view, able to wrap things up." Human curators made lots of tough ethical decisions about using voice mails from people on hijacked planes and pictures of people jumping out of burning buildings. But, Greenwald says, she couldn't entrust a single person to hand-select a few moments and stitch together a story. An algorithm, on the other hand, finds correlations. "So there's a kind of objectivity to that that you don't have in a more subjective, organized, curated environment," Greenwald says. Mary Anne Staniszewski, an art historian at Rensselaer Polytechnic Institute, rejects that idea. "No, it's not objective because an algorithm did it." Staniszewski has seen many artists use algorithms to create part or all of an image. While "Timescape" gives the algorithm a much more prominent role than is typical, she says, it's not free of bias. For instance, it only reads English-language news sources. "Very typical of an American point of view of things," Staniszewski says. When I look at "Timescape" and see a headline about the crash near Shanksville, Pa., I feel like I'm chasing words on a wall. But visitor Edward Fleming has a flash of pride. 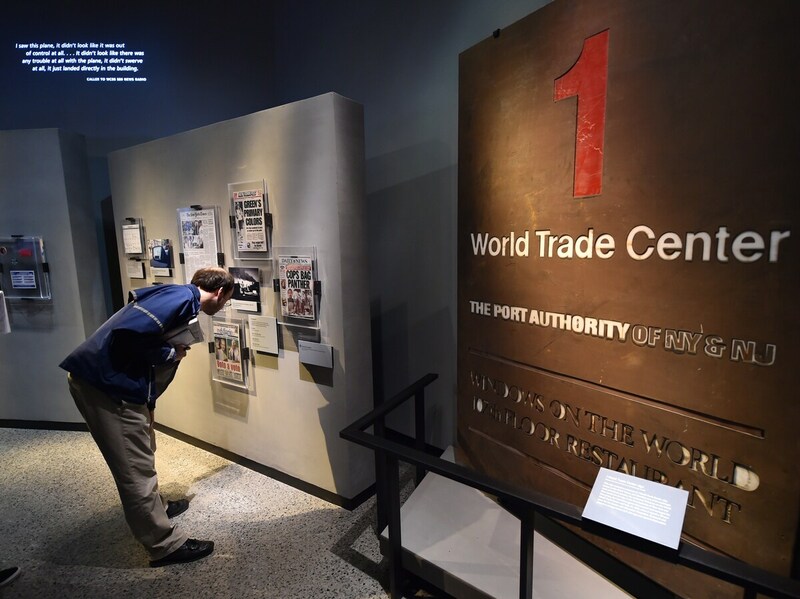 A One World Trade Center sign and exhibits are viewed during a press preview of the National September 11 Memorial and Museum in New York City. "The people on board took over control of the plane," he recalls. "It crashed because of them taking over control. At least it didn't get to its designated spot." Humberto Suarez has another kind of response. He's resting after looking hard for the face of his cousin who died in the towers. "Over there on the wall," he points behind him. "It's very hard to find. You need very good eyes. But we did it. My wife and my sister-in-law, we found them." Suarez is so tired from that hourlong search, he's giving this wall a blank look.